Eyelid diseases are very common in dogs, affect the function and health of the eye, and are the first line of defense! Eyelid disease are less common in cats, but are more serious. This article reviews the anatomy and physiology of the lids, neonatal and congenital lid disorders, and cilia disorders. The lid is comprised of skin, palpebral conjunctiva, collagen, muscle, and glands, each of which performs an important function for maintenance of good ocular health. The orbicularis oculi m. acts to close the lid with a zipper-like motion from lateral to medial, moving tears and debris to the lacrimal puncta. The levator superioris elevates the upper lid. The levator anguli oculi medialis elevates the medial lid, and the malaris muscle contracts to open the lower lid. The medial palpebral ligament is very tight. It is important to release this when performing an enucleation, and in medial canthoplasty in brachycephalic dogs. The lateral palpebral ligament is a landmark and place to tack the canthus in floppy lidded dogs (Mastiffs, St. Bernards). Eyelids are thin and pliable to allow easy movement over the globe and cornea. Cilia (eyelashes) are present in the upper lid. Long vibrissae, tactile hairs, are present in a raised tuft in the skin above the eyelid dorsal to the medial canthus. The lid margin should be smooth and hairless for good function. Meibomian gland openings, 30-40, are on both upper and lower lid in a groove. This groove serves as landmark for aligning sides of a wound at the lid margin for good apposition. Sebaceous glands produce part of the oily layer of the tear film and are the site of chalazia (internal stye), hordeolum (external stye), eyelid tumors and granulomas. 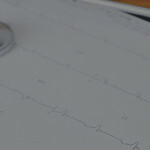 In dogs, this is a thin, flexible fibrous plate that, when engaged, can help with eversion of the lid in entropion cases. Lid margins meet at the canthi, with 3-5 mm of skin that continues on to the conjunctiva. The minor “bump” here is the lacrimal caruncle. True cilia are not normal here. 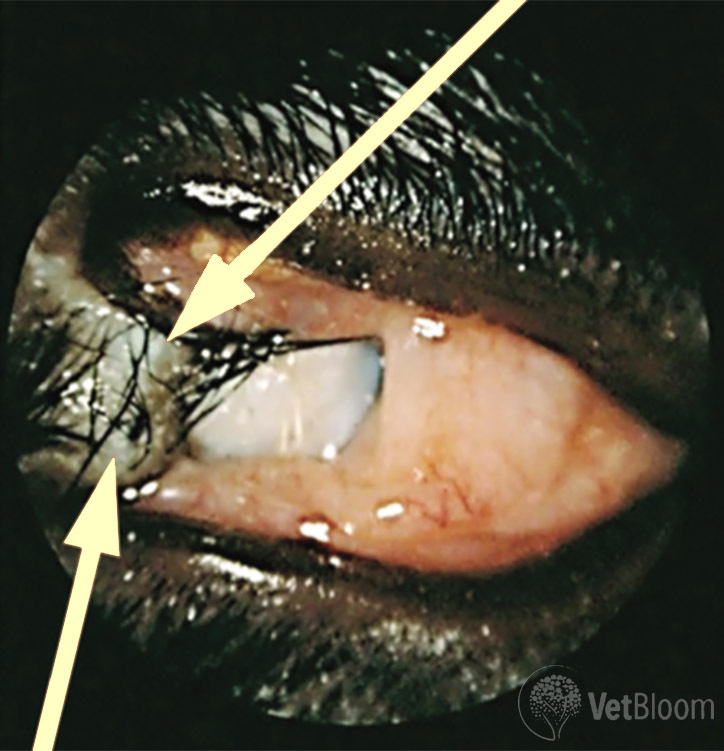 If there are cilia, this is called “medial cantonal dermis.” In this condition, common in Shih Tzus, long hairs irritate the cornea and cause tear staining. Sensory innervation of the lids is via CN V, the trigeminal nerve. Exquisite sensitivity is present in this area to protect the eye. Motor innervation is via CN III, the oculomotor nerve, controlling the upper lid; CN VII (facial n.) controls the orbicularis oculi m. to close the lids; sympathetic innervation supplies the medial upper lid. A deficit of the sympathetic innervation causes the ptosis seen in Horner’s syndrome. The generous blood supply can make lid surgery messy, but affords good healing. The blood supply is from the medial and lateral palpebral arteries. The ample blood supply also leads to profound hyperemia and lid edema in inflammatory reactions (bee sting). Lymphatic drainage is to the parotid gland primarily, with some to the submandibular gland. The lids protect the globe by providing a physical barrier, by trapping & removing debris from the conjunctiva, and offering the sensory and protective effects of the vibrissae and cilia. The lids spread the tear film, decrease evaporation of tears and pump the tears to the lacrimal puncta. Eyelids open at 10-14 days in puppies and kittens. Premature opening can lead to corneal desiccation, keratitis, pigmentation, ulceration, and perforation since the lacrimal gland is not ready with enough tear production. Therapy includes frequent topical artificial tear ointment, q 1 h, or a temporary partial tarsorrhaphy. Delayed opening leads to accumulation of mucous and tears, “neonatal ophthalmia.” When infection is present, the condition is called “ankyloblepharon.” The most common pathogens involved in kittens are Chlamydia or Herpes, in dogs it is Staphylococcus. lids manually using gentle digital pressure. If unsuccessful, insert hemostats in medial canthus to leverage them open. Never use a sharp object to open lids or incise them. Flush w/ saline or dilute (1:50) povidone-iodine solution. Never use chlorhexidine for flushing as it causes corneal damage. is erythromycin, terramycin, or ofloxacin TID for one week. Do not use triple antibiotics; may cause anaphylaxis and death in felines. For puppies, use triple antibiotic ointment TID for one week. Fig. 1: Dermoid in the lid of a 7 month old Lab Mix. Dermoids are ectopic lid tissue often found in the temporal cornea, but also in the palpebral and bulbar conjunctiva in dogs. They cause irritation, discharge and impair sight. Superficial keratectomy (and excision of the conjunctival component) under the operating microscope is curative (Fig. 1). and ulceration. This condition is best referred to an ophthalmologist for reconstruction or cryosurgery. This may be either congenital or acquired. Weight gain can exacerbate this problem as subcutaneous lipid accumulation “pushes” the folds in to the eyes. Pugs, Pekingese, Boston Terriers, and English Bulldogs are most often affected. Unfortunately, and not coincidentally, these breeds also have prominent globes, are prone to KCS, and have large eyelid openings (macroblepharon). This is best corrected with facial fold resection, or a medial canthoplasty. The latter is usually performed by an ophthalmologist and improves or resolves nasoventral entropion, trichiasis and exposure keratitis. Fig. 2: Distichia in a 1 year old Shih Tzu. Distichia are cilia coming from the Meibomian gland that irritate the cornea and can cause ulceration. They usually appear before age two, can be uni- or bilateral, and may occur in a similar location in each eye. Distichia are often breed related or inherited. They are difficult to see and may only be visible with the magnification and illumination of the slit lamp, as is true of ectopic cilia as well (Fig. 2). These cilia are very short and emerge through the conjunctival surface of the lid, usually the upper lid. Only a pigmented ring around the emerging cilia may be visible. Fluorescein can help to highlight emerging cilia. This problem is common in Poodles and Bichons, and occurs when normal hairs curl or grow at an abnormal angle and rub on the cornea. The latter may occur after lid trauma or lid surgery. It is essential to use magnification and a good light source. The direct ophthalmoscope can be used, or a loupe and halogen penlight. It helps to manipulate the lids to change the lid’s angle, allowing the lid margin to be highlighted against the sclera or pupil with retroillumination, or the third eyelid. Instilling fluorescein may highlight the cilia, or there may be a mucous tag on the cilia. Epiphora, or excess serous discharge, blepharospasm and rubbing are common. It is a hair in the eye! if many cilia, generalized. Cilia disease may cause a corneal ulcer that is shallow, often linear or vertically oriented, and adjacent to the cilia. 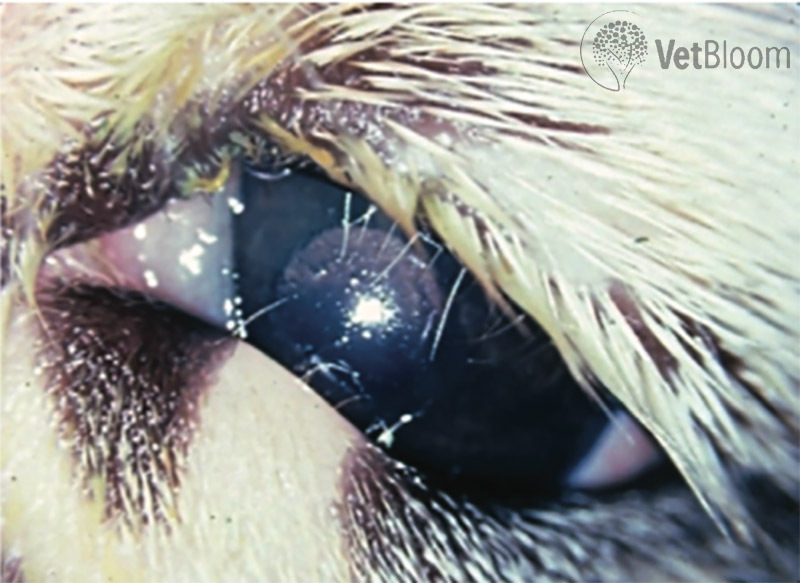 Deep, melting ulcers are common in brachycephalic breeds, often requiring surgical repair. If a pet has more than one corneal ulcer of unknown cause, referral to an ophthalmologist is recommended to identify the cause early, allowing for intervention. Electroepilation is tedious, requires high magnification, and is only useful if only a few cilia are troublesome. If used, a direct current with a fine, guarded needle should be used with low current (1-5 mA). Most common electrosurgical units supply high frequency, alternating current, resulting in severe necrosis and scarring. Manual epilation can provide a temporary measure for comfort and help assess the clinical significance of cilia. This is not a treatment for distichiais. The CO2 laser is unproven to help, causes scarring and distortion of the lid. The tissue containing the ectopic cilia is excised by isolating the tissue with a chalazion clamp, then using a 2 mm biopsy punch or a #65 Beaver blade. Adequate magnification is essential; 4x loupes at a minimum with a bright illumination on the site. Most ophthalmologists treat the base with cryosurgery at the same time. Postoperative care is the same as for distichiasis. Keep the fur around the eyes short with regular grooming (Shih Tzu, Lhasa Apso, Poodle, Bichon). This affords better hygiene, early detection of ocular problems, and improved vision. Cilia in the medial canthus and medial caruncle may be treated with cryoepilation. Trichiasis due to an anatomic problem, i.e. nasal folds, entropion, eyelid coloboma, should be treated surgically. Medial canthoplasty is an excellent, all-purpose solution, for most of the causes of trichiasis in the medial canthus.